ST. GEORGE – Dixie State welcomed its first students under the official banner of a university Monday. As the new university continues to expand its offering of courses, degrees and facilities, issues associated with that expansion also come up. 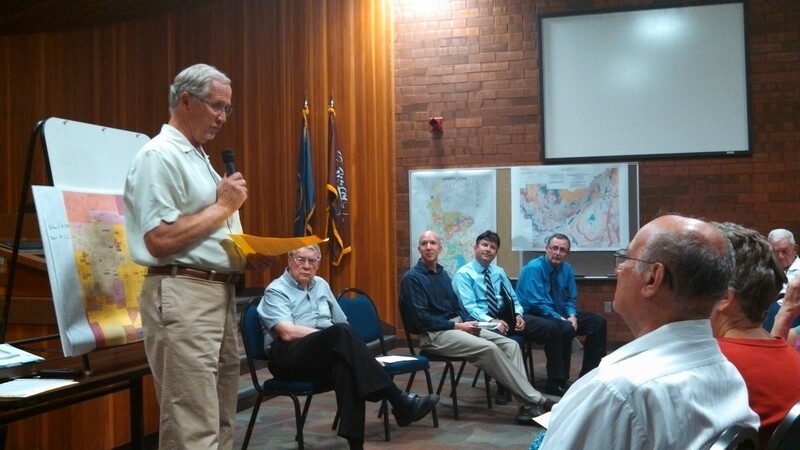 Two of those issues, namely student housing and parking, were the focus of an informational meeting at the St. George City Hall Monday night between representatives of DSU, the City of St. George, and numerous residents living in the downtown area near the university. 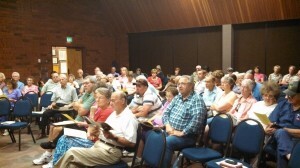 Organized by Doug Alder, who served as DSU’s president from 1986-93, and Georgia Baker, people who live in the area of St. George Boulevard to 700 South, and 400 East to 1000 East, were invited to hear a review of the zoning laws around DSU regarding housing, as well as have any worries and rumors about the University’s search for additional student housing addressed. Though the gathering took place at the St. George City Hall, it was not an official city meeting. “This is strictly an informal meeting,” Parker said. When he was the president of DSU, Adler said, the school had around 2,000 students. That number has multiplied four times since, giving a general estimate of over 8,000 students currently enrolled at DSU. “We feel the need for additional housing,” said Paul Morris, DSU vice president of administrative services. DSU’s hunt for additional housing was a concern to some of the meeting attendees who said they heard rumors that the university would try and buy up property along 700 East and seek zoning changes to allow for multifamily dwellings or, in other words, apartments for students. Currently the bulk of 700 East is zoned for single-family dwellings, with an exception for multifamily dwellings on parts of 700 South. “The city doesn’t see a change (in the zoning),” said Bob Nicholson, a community development coordinator representing the City of St. George. It was noted that private homes around DSU have been rented out to students. Nicholson said the city allows a homeowner to rent a home to a single family or to four different people who are not blood related as long as they have a business license with the city and meet certain ordinance requirements. “We will enforce that limit,” Nicholson said. The university isn’t looking at off-campus properties, Seth Gubler, DSU’s director of housing and student life, said. “We’re finding more and more students who want to live on campus,” Gubler said. DSU would rather build housing near preexisting on-campus facilities. The university wants to be able to house an additional 300-350 students on campus. So far, one of the main problems has been how to go about financing a new building. One route would cost between $20 million to $30 million. There was also the possibility of bonding for the new building, but to do so would result in a rise in student tuition fees. “It (hasn’t) been financially feasible,” Gubler said, though the university continues to consider its options and is happy to accept donations, he said. As for private homeowners who rent their homes to students, Gubler said the university has little control over what the students do, though should the students violate DSU’s “Code of Student Rights & Responsibilities,” which applies on and off campus, then the university may be able to issue some form of discipline. “We want to have good relationships with our neighbors,” Morris said. As for parking concerns, a multilevel parking facility is in DSU’s master plan, Morris said, but like the student housing, finding readily available financing for it is another matter. Alder said DSU is a perfect place for students to use bicycles to get around, and there is potential for the university and city to work something out concerning mass transit in the future. The question of DSU’s status concerning the pending purchase of East Elementary from the Washington County School District came up. Morris said there is “still very much negotiation going on” between DSU, the school district, the City of St. George and the Lions Club. Morris said DSU would not tear down the elementary school for student housing. Instead, it would use the property for an education center focused on teacher-training. This possibility is still up in the air, however. The working theory of what would occur if the university acquired the school involves the school district getting the property where the Dixie SunBowl currently resides for a new elementary, hence the Lions Club and City of St. George’s involvement. In exchange, DSU gets East Elementary while also making Hansen Stadium available for future Round Up Rodeos. “At this point it’s a negotiated concept,” Morris said. I know this isn’t the point of the article, but can someone explain to me how exactly they will be doing the round up rodeo in Hansen stadium? Right in the middle of football season? I’m not sure, but I got a good chuckle out of it. Ummm, it’s not at the Hansen, it’s at the Sunbowl! They need to build multi-level parking structures and student housing is going to have to be high rises sooner than later. God-forbid, some apartment buildings may be as tall or taller than the lds temple!